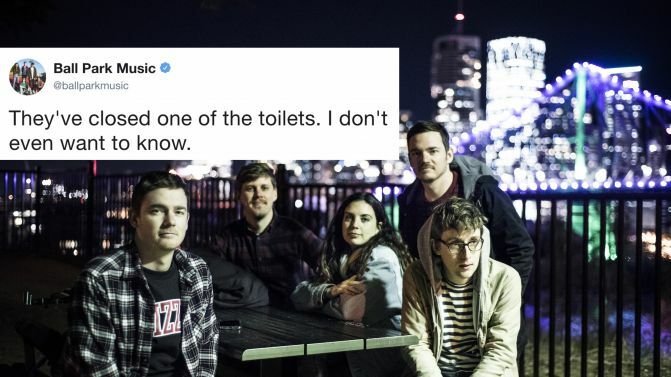 Indie-rockers Ball Park Music are making a name for themselves as masterful live-tweeters of the annual ARIA Awards. After making headlines last year with their insightful (and clearly drunk) take on the 2016 ARIAs, the band have just backed it up with another play-by-play of Australian music’s night of nights. Very sorry we can’t be at the #ARIAs this year to provide salty online commentary. Hey guys, Jen here. Got a last minute ticket to the ARIAs. Can't guarantee salinity of commentary, but wish me luck! …Jennifer was in the venue and things kicked off! Whoa we get a DINNER BREAK! They must have realised how drunk everyone got last year. They've closed one of the toilets. I don't even want to know. Does anyone have a micro USB cable? I have three muesli bars in my bag in case anyone needs a snack. Ball Park Music will take their live-tweeting skills around Australia when they embark on a new national tour in 2018, in support of their latest single ‘Exactly How You Are’. For all the winners (and losers) from this year’s ARIA Awards, head here.